A delicious, healthy raw vegan dessert. 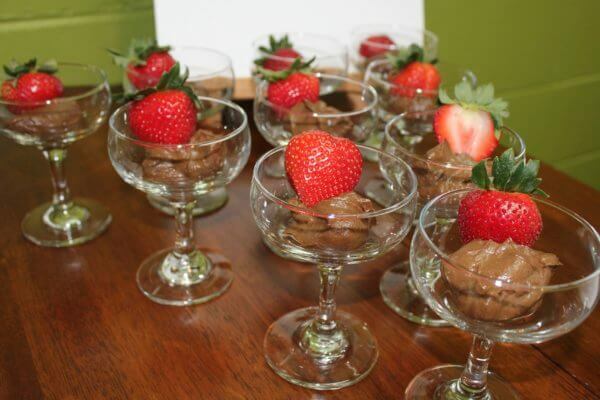 This decadent avocado chocolate mousse is easy to make and nearly guilt free! Top with fruit or enjoy by itself. This recipe can stand alone as decadent dessert, or can be used as an icing replacement for your favorite cakes or cupcakes. In 5 minutes, you’ll have a fresh, low-sugar dessert that everyone can enjoy. In a blender or food processor, blend until smooth. Chill slightly. Best when left overnight and enjoyed the next day. Top with fresh fruit, shaved coconut, and/or cacao nibs.